Do you need to change any of those things? I find myself getting into patterns of behavior that are sometimes awesome and life-giving and sometimes destructive and harmful. Every habit starts out as a series of decisions. But even before the decisions, our habits begin with how we feel and think about ourselves. Do you need to think about yourself, your worth, or your body differently? Could you be kinder and give yourself more grace as you walk through your health journey? I know I can. 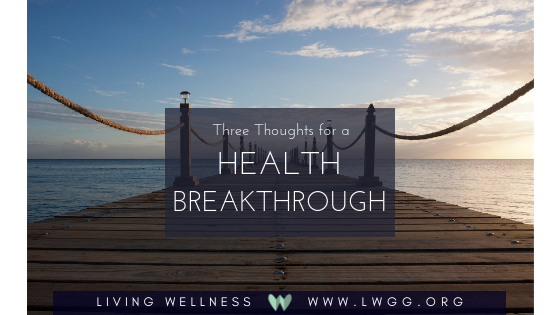 Susie was describing how “what happens in our soul happens in our cells” and that often when we battle longstanding physical issues, there is underlying healing that needs to take place before the body will heal. Specifically, she suggests that unresolved grief is at the root of a whole host of medical issues. The question “What are the hindrances in my own soul to my own healing?” may need to be handled with a professional if you have some deep emotional issues that have been stuffed down. I encourage you to find a good counselor or therapist and work through the stuff that has been hindering you from experiencing healing. Let me be clear in saying that not all sicknesses & diseases have a mental, spiritual, or emotional root. But most doctors agree that some issues are connected to a deeper root, and that dealing with those places of pain or grief may significantly aid in full and lasting healing. What would my life look like if I wasn’t afraid? What would your life look like if you weren’t afraid? Would you do anything differently? I think to live completely without fear is unrealistic, unnatural even, but to be courageous and step into our calling even in the midst of fear is a worthwhile pursuit. One theme that comes up with fear and health & wellness is the fear of failure. This prevents people from ever beginning their journey because they have tried so many times, they just can’t bear the thought of failing, again. Or they have been told they are a failure and they believe it, so efforts are useless to begin with. These are both lies. I struggled with fear of failure for about 10 years with my weight. As a new personal trainer, I felt immense pressure to maintain a healthy weight. For almost 10 years, I felt like I was always fighting with extra weight that would just not STAY OFF CONSISTENTLY. It wasn’t until I got help from a friend and fellow colleague, Kelley Suggs, to tackle some root health issues that I have been able to win the fight and lay down that burden for GOOD. For me, it took the courage to say I have tried 100 times, but my health is worth the fight, I’m going to change directions and give it another go. I had to let go of the fear of failure with that aspect of my health multiple times in order to see positive change. Choosing courage has been worth the effort every time. Is there anything in your life that needs to be changed? What are the hindrances in your own soul to your own healing? Are you letting fear get in the way of living your most abundant life? I’ll be praying for your breakthrough as I work for mine! Remember, you are worth more than mediocrity. God made you to live out JOY!